I have tons of great stories and photos for you, but this one takes precendence. This morning I tried something fairly foreign to me. I decided to make dinner in the crock pot before leaving for work. Let me preface this story with the fact that I am not the most domestic mom out there. My repertoire of homemade meals is small, while our list of restaurants frequented is long. Now that we live out in the back 40 (and are the very definition of "house poor"), we want to turn over a new leaf and make eating at home a priority. 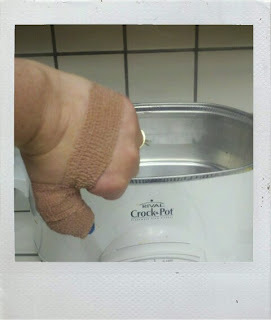 This brings me to this morning's "crock pot incident." Which is really more of a "chicken incident. "Which, okay let's be honest, is really more of a "Beck's misuse of a steak knife incident." I knew better. I really did. My history with knives isn't a good one. A professor from college still remembers that, more than 10 years ago, she asked me to chop vegetables at an end-of-year party in her home. I gave it my best effort, but she took one look at me and knew I didn't have the faintest idea how to chop vegetables or use a knife properly. Fast forward to this morning. I am a little better at chopping vegetables, but I am notorious for holding the knife wrong or getting my fingers to close to the blade. As I was carelessly trying to pry the packaging off the backside of the frozen chicken with a steak knife and my mom looked on with the words "be careful not to cut yourself" on her lips, my hand slipped and I took a pretty good chunk out of my left thumb. It hurt. I may have used a bad swear. The worst part - I left a message at work to tell them I'd be late due to slicing my thumb while preparing dinner. Apparently this generated several questions. The most important was not whether I would be maimed for life, but rather a) What was I doing making dinner in the morning? and b) what was I doing making dinner at all? - "She doesn't cook!" Clearly I have a reputation. Pioneer Woman I am not. For the record, the chicken came out of the incident unscathed and mom came to the rescue and finished the preparations for tonight's meal while JP and I went to the hospital to make sure my thumb would remain intact. Our first visit was unsuccessful as our local medical office does not provide emergency care. We decided it was fine; cleaned and bandaged it and went our separate ways to work. After several people told me I should be concerned with the fact that I couldn't straighten out my thumb, I decided to call the advice nurse for further instruction. An afternoon at the ER being splinted, glued and poked with a tetanus shot followed. The jury's still out on whether or not I nicked a tendon or a nerve and follow up with my regular doctor, as well as a visit with the plastic surgery department, was prescribed. All in the name of being domestic. Should have gone ahead and picked up a pizza like mom suggested. Happy weekend! I have a full slate of events for work on the schedule. Wish me luck that I can do them all with a bum thumb! Oh friend! I'm sorry. :( That is terrible. Oh Becky, that is so terrible. I feel squeamish just reading it. I really hope you didn't get a tendon or a nerve! I put a knife through my hand trying to get a pit out of an avocado once and they were afraid I may have damaged something, but all feeling and movement returned in no time. I pray you have the same outcome!